Two years ago, Mazda unveiled the RX-Vision Concept at the 2015 Tokyo Motor Show. It was the first big unveil that year and got everyone excited at the prospect of a new Mazda rotary sports car. This year, no such luck; but we do have cars that carried over the RX-Vision’s design language. This year I’m glad Mazda came in full force. In a show where autonomous EVs with artificial intelligence dominated the stands, our favorite underdogs from Hiroshima showed not one but two gorgeous concepts of what we can expect their next generation cars to look like. Just look at it. Long bonnet tapering to a short bump with the wheels stretched out to the corners. The clean and elegant lines remind me of something more European and exotic, something more befitting a British or Italian logo. Inside it was very minimalist and driver oriented. There’s not a lot of unnecessary surfacing and angles going on inside. It’s quite retro in a sense. Where most cars these days, especially at the Tokyo Motor Show, were over-styled messes, the Vision Coupe Concept was proof that less is more. I particularly liked the stance and presence of it from the front while the taillights at the rear gave it a sporty look. If the production Mazda6, or whatever car this turns into, looks half as good as this, then Mazda is on to a winner here. There’s method to this beauty as well. It’s another step in Mazda’s journey to becoming a premium brand, or at least a brand with more premium options. That doesn’t necessarily mean they’ll be raising prices. Instead, Mazda wants to “forge a strong connection with customers and become an essential part of their lives”. The Kai is said to debut Mazda’s new vehicle architecture which the company claims will apply “the human centered design philosophy to optimize every function.” Like the Vision Coupe Concept it features Mazda’s latest Kodo design. It looks pretty much ready for production. Tone down the massive concept car wheels, throw in some normal door handles, and give it proper wing mirrors and voila! There’s the 2019 Mazda3, ready to replace the current four-year-old car. The Kai Concept also incorporates Mazda’s trick new SkyActiv-X engine. It’s been a goal for several companies to have a gasoline engine with the fuel efficiency and torque of a diesel. 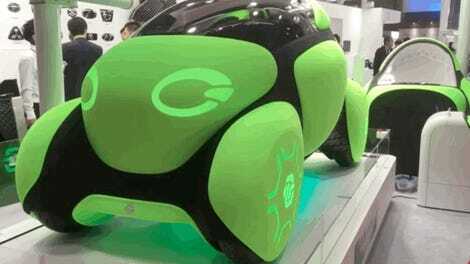 It will be the first engine that uses Spark-Controlled Compression Ignition to be mass-produced. It’s great to see Mazda continuing on with the internal combustion engine—unlike its Japanese counterparts who seem to have moved on towards EVs, PHEVs, and Fuel Cells. 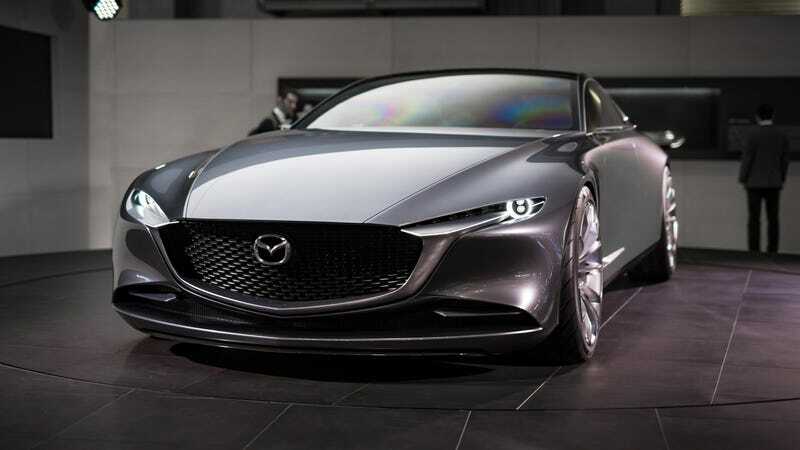 So a round of applause for Mazda, for daring to defy the norm of this year’s motor show and actually caring about the internal combustion engine, driving pleasure, and creating cars with a very good looking design.